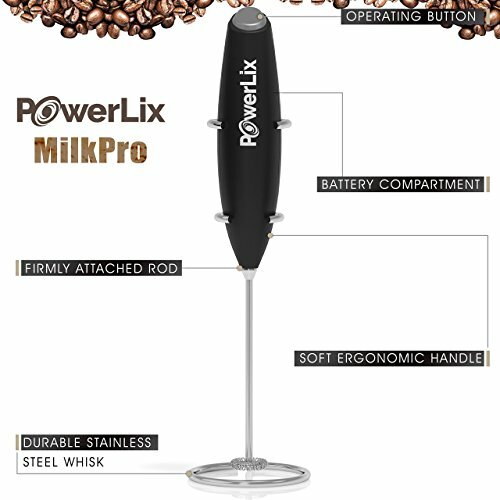 PowerLix Milk Frother Handheld Battery Operated Electric Foam Maker For Coffee, Latte, Cappuccino, Hot Chocolate, Durable Drink Mixer With Stainless Steel Whisk, Stainless Steel Stand Include. 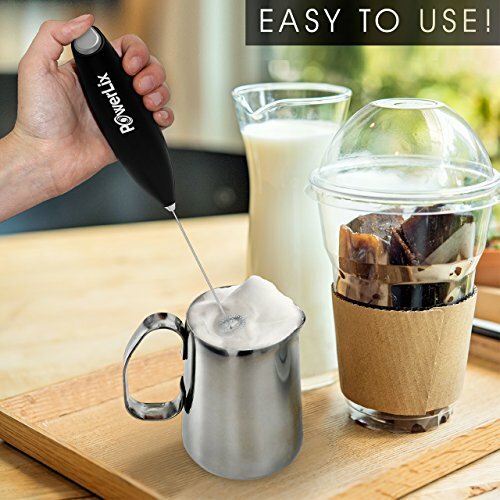 GET CREAMY FROTH QUICKLY: Powerlix brings you its portable handheld milk frother for frothed milk. 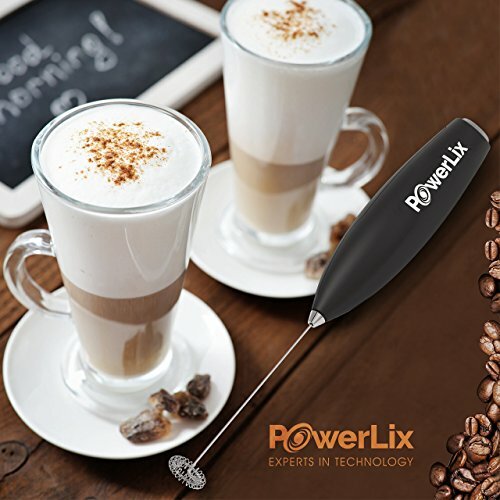 If you love your morning coffee with lots of froth and foam, then you certainly want to have Powerlix frothing wand at home or your café style cappuccino. It comes with a stand for easy storage and can be kept on the countertop. BATTERY OPERATED FOR PERFECT FROTH IN NO TIME: The mixer is battery powered so you don’t have to worry about cords and finding sockets. Heat up the milk, immerse the espresso maker into the cup and turn it on. The milk foamer will start creating creamy froth on the milk instantly. Within 15 – 20 seconds, you have a cup filled with creamy froth and ready to go into your coffee latte. QUALITY YOU CAN TRUST: Our milk whisk frappe maker is made of the best quality stainless steel. It has a powerful motor that gives you 19000 rpm and the dual spring durable long 18/10 food safe material stainless steel spiral whisk that won’t rust or break over the time, delivers double the power of other frothers and professional espresso makers available. The power button on top makes it easy to use. The low noise motor barely makes a sound. Treat yourself to a café style cappuccino or latte every day. Why spend money on cups of espresso when you can create them every day at home in the comfort of your kitchen. 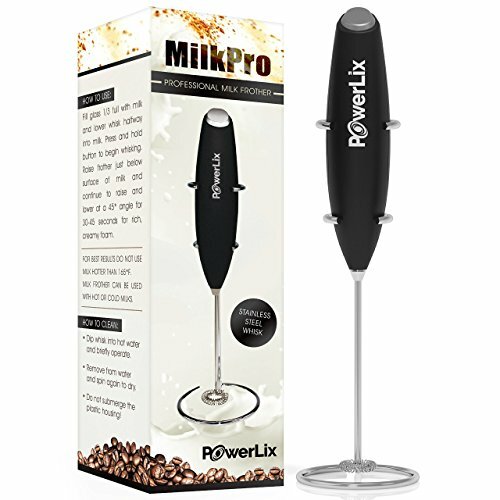 Powerlix milk frother will give you a great cup of your favourite coffee every morning. 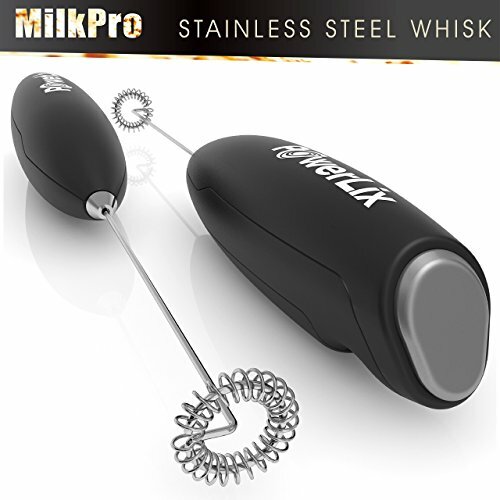 Milk Frother: Powerlix Milk Frother is a handheld battery operated milk foamer machine. It is a frothing wand that can instantly froth hot or cold milk for your favourite drinks. Where ever you need frothed milk or cream, Powerlix Frappe maker will do the job for you quickly and easily. Milk Frother Handheld Battery Operated Electric Foam Maker For Coffee: milk frother, coffee foam maker, milk foam maker.